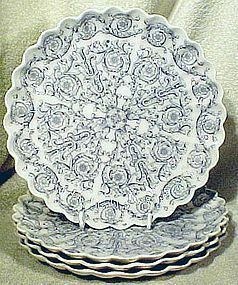 A set of four 8-1/2" English porcelain fluted edge or scalloped breakfast plates in the Rome pattern, made by Copeland Spode. Each has an impressed 80 year date (1880), and these plates have the grey/black colourway. They have the early impressed Copeland mark, and two have the printed Copeland mark; each has impressed pattern and month marks. 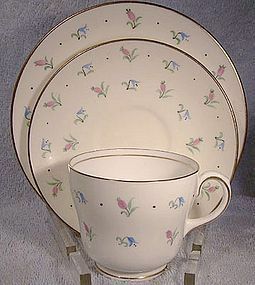 This set is in excellent original condition with no chips, cracks, crazing, damage or repairs; each one has some very minor cut marks not affecting the pattern and one has some over-glazed frit near the edge, which would be original to the manufacture of the piece. All items are thoroughly and conservatively graded and all condition issues are noted; all items are vintage or antique and may have slight signs of gentle use. Expedited tracked and insured parcel shipping to the U.S. starts at $24 (other spots may vary, air is higher). Items paid with a credit card will be shipped to confirmed addresses only. We do ship internationally. All of our prices are in $US. PLEASE NOTE: We DO NOT accept PayPal. 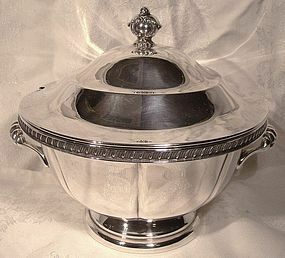 A Rogers silver plate covered round sauce or small soup tureen circa 1950s - perfect for your next dinner party. It stands 7-1/2" high and it measures 7-5/8" across. It is stamped WM.A. ROGERS S.P. COPPER LEAD MTS 9102 and it has an etched ID number with initials above the Rogers planchet. It is in excellent condition with no dents, bends, corrosion, losses, damage or repairs. All items are thoroughly and conservatively graded and all condition issues are noted; all items are vintage or antique and may have slight signs of gentle use. Expedited tracked insured parcel shipping to the U.S. starts at $23 (other spots may vary, air is higher). Items paid with a credit card will be shipped to confirmed addresses only. We do ship internationally. All of our prices are in $US. PLEASE NOTE: We DO NOT accept PayPal, only VISA and MASTERCARD. 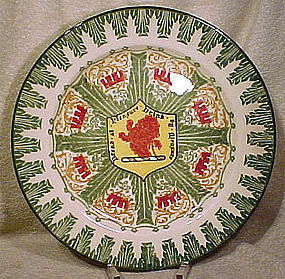 A decorative Royal Doulton series ware Bread as Pleasure D3444 plate with an heraldic motif, in the pattern number D3444. This plate features a green acanthus border with repeating turrets and scroll sections and a central crest with a lion and the legend BREAD AS PLEASURE DRINK BY MEASURE. It may be from their heraldic series (we're not sure and any help with identification would be appreciated), and it is in excellent original condition with no chips, cracks, losses, damage or repairs other than some overall crazing (a few stained craze lines on the front) and a later attached and painted hook for hanging on a wall (there is a light flare on the first picture). 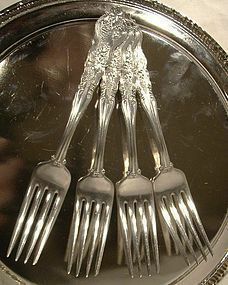 All condition issues are noted; all items are vintage or antique and will have signs of use/patina. Tracked parcel air post to the U.S. starts at $17.50 (other spots may vary). Items paid with a credit card will be sent to confirmed addresses only. We do ship internationally. All of our prices are in $US. PLEASE NOTE: We DO NOT accept PayPal, only VISA and MASTERCARD. 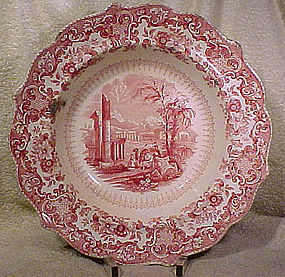 A scarce and early red and white transfer large 10-1/2" rim soup bowl c1830s, in the Tadmor In The Desert pattern. From Jackson's Warranted (England) Holy Bible series, this early c1830s bowl is in fair original condition with no cracks, or repairs; it has the following condition notes - some minor inner rim losses (largest shown is 1/2", looks like a spoon rested in that spot for about 150 years, the rest are small), some minor outer edge glaze flakes, loss of gloss and fine network of cutmarks to the bowl interior from decades of use (not affecting transfer), allover crazing visible on back only, stained area on back. In fine condition considering its age, this scarce bowl shows quite well. All items are thoroughly and conservatively graded and all condition issues are noted; all items are vintage or antique and may have slight signs of gentle use. Small packet air shipping to the U.S. starts at $16.50 (other spots may vary). Items paid with a credit card will be shipped to confirmed addresses only. We do ship internationally. All of our prices are in $US. PLEASE NOTE: We DO NOT accept PayPal, only VISA and MASTERCARD. 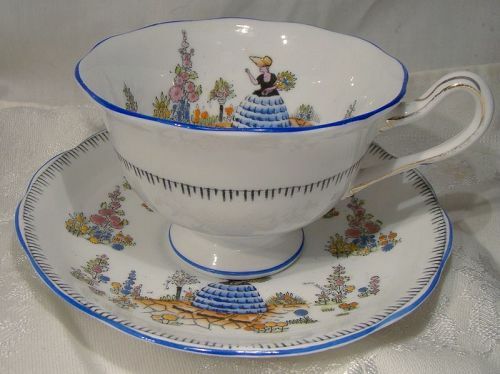 AYNSLEY PRINCESS MARGARET 1958 CANADA VISIT Cup & Sauc. 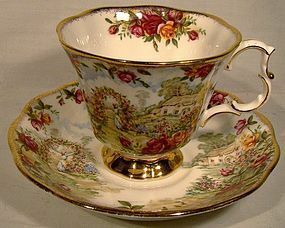 A hard to find Aynsley 2-1/8" high cup and matching 5-5/8" saucer commemorating Princess Margaret's 1958 visit to Canada. 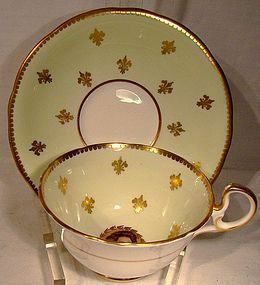 This cup featuree gold decoration with fleur-de-lis flowers and a portrait in the center of the cup, all on a light green ground. 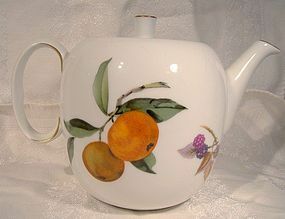 It has the Aynsley mark with the legend TO COMMEMORATE THE VISIT OF H.R.H. PRINCESS MARGARET TO CANADA 1958 D1180/2. This item is in excellent condition with no chips, cracks, crazing, losses, damage or repairs. All items are thoroughly and conservatively graded and all condition issues are noted; all items are vintage or antique and may have slight signs of gentle use. Small packet air shipping to the U.S. starts at $14.50 (other spots may vary). Items paid with a credit card will be shipped to confirmed addresses only. We do ship internationally. All of our prices are in $US. PLEASE NOTE: We DO NOT accept PayPal, only VISA and MASTERCARD. 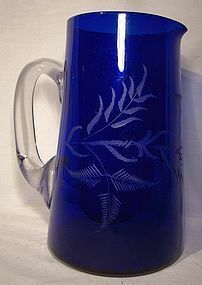 A mid-Victorian 19th century 7-3/8" high hand etched water pitcher in cobalt coloured glass. It features hand etched frond decoration and a clear applied heavy handle, and this unsigned serving item is in excellent condition with no chips, cracks, losses, damage or repairs. All items are thoroughly and conservatively graded and all condition issues are noted; all items are vintage or antique and may have slight signs of gentle use. Small packet air shipping to the U.S. starts at $16.50 (other spots may vary). Items paid with a credit card will be shipped to confirmed addresses only. We do ship internationally. All of our prices are in $US. PLEASE NOTE: We DO NOT accept PayPal, only VISA and MASTERCARD. 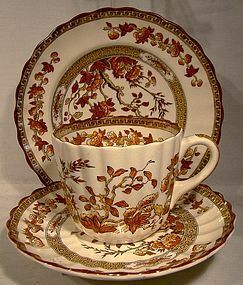 A hand painted Ashworth Imari ironstone dinner plate from 1899. 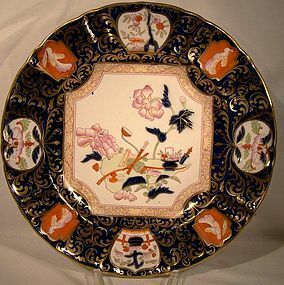 This wonderfully decorative Victorian 10-1/2" dinner plate is in the Imari palette with a cobalt and gold border and a central floral panel with Oriental cameos around the edge. We haven't found a name for this pattern however B2050 is the same except with a black ground. It has various stamps including the Ashworth's Ironstone crown mark, B, an artist cypher, the B3665(?) pattern number, an impressed W, plus a hard to read impressed mark and a 7/99 date stamp. This super display plate is in excellent condition with no chips, cracks, crazing, losses, damage or repairs. All items are thoroughly and conservatively graded and all condition issues are noted; all items are vintage or antique and may have slight signs of gentle use. Tracked Packet shipping to anywhere in the U.S. is $17.00 - this includes online tracking, air service and insurance up to $70. Items paid with a credit card will be shipped to confirmed addresses only. We do ship internationally. All of our prices are in $US. PLEASE NOTE: We DO NOT accept PayPal. 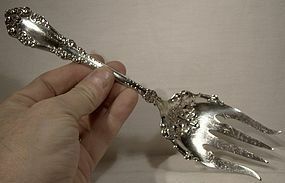 A signed Birks sterling silver loop handled baby feeding spoon in the Chantilly pattern. 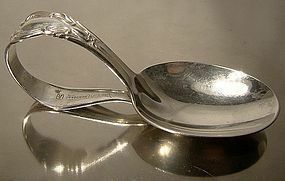 This spoon is stamped BIRKS STERLING with a 1965 date mark, it weighs 17.9 grams, and it is in excellent condition with no monograms, dents, bends, corrosion, losses, damage or repairs. All items are thoroughly and conservatively graded and all condition issues are noted; all items are vintage or antique and may have slight signs of gentle use. Small packet air shipping to the U.S. starts at $9.50 (other spots may vary). Items paid with a credit card will be shipped to confirmed addresses only. We do ship internationally. All of our prices are in $US. PLEASE NOTE: We DO NOT accept PayPal, only VISA and MASTERCARD. 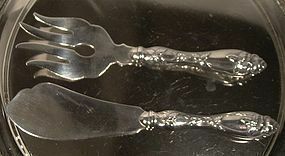 A fine and vintage Scandinavian sterling silver pair of fish servers mady by the Finnish firm of Miettinen + Nurmi (1947-60). This pair has the date stamp for 1959 and 813H and the maker's mark. 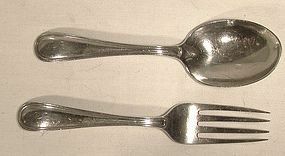 The 6-3/8" long fork comes with the matching 7-1/4" long fish knife. 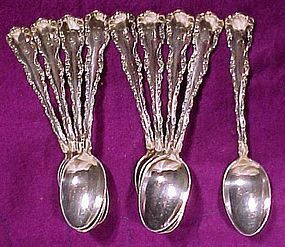 Unusually, both the blade and handle are also .813 silver, and this set has never been monogrammed. This pair weighs 68.7 grams and it is in excellent condition with monograms, dents, bends, corrosion, losses, damage or repairs other than a patina on the blade and tines from use. All items are thoroughly and conservatively graded and all condition issues are noted; all items are vintage or antique and may have slight signs of gentle use. Tracked Packet shipping to the U.S. starts at $16.50 - this includes online tracking, air service and insurance up to $100. Items paid with a credit card will be shipped to confirmed addresses only. We do ship internationally. All of our prices are in $US. PLEASE NOTE: We DO NOT accept PayPal, only VISA and MASTERCARD.